I always enjoy visiting the in-laws in the San Diego area. In addition to the lovely weather, the beautiful flowers and cacti that seem to line every road, and the quality family time, there are plenty of wine and food pleasures. 1998 Hafner Cabernet Sauvignon, (available only at the winery, price unknown but probably about $30). Hafner Cabernet and Chardonnay are house wines at pop-in-law's. This mature Cabernet was dark and opaque with a nice perfume of cassis and a hint of mint. Fruity and rich, but not at all overwhelming. Quite good with our steaks. This is the third or fourth vintage I've tasted with pop-in-law and I'm a fan. NV Perrier Jouet Champagne, about $30. A flute was handed to me one evening and I took the opportunity to taste the wine "blind." I guessed it might be an American bubbly because it was a little sweet, and it was without the chalky yeasty thing that says "I am Champagne, hear me roar." Imagine my surprise when the bottle appeared to top off our flutes and it was Perrier Jouet, thus far my favorite big house Champagne. Ah, the humbling glory of tasting blind...It was good, but didn't hold a candle, in my opinion, to the grower stuff I've been digging lately. 2002 Domaine William Fevre 2002 Chablis Grand Cru Bougros, price unknown but probably about $45. I am just starting out on Chablis and I already have a little thing for Fevre, so when pop-in-law handed me his wine list, I eagerly selected it to accompany a dinner of shrimp salad and market vegetables. Sadly, it was distinctly underwhelming. Lots of oak, a very restrained nose and palate. Some clean lime after 45 minutes, but the personality on this wine is a no-show. Where are the minerals? The nervy acidity? Where, I beg of you, WHERE? 2000 Baumard Cremant de Loire Cuvee Millisime, $7 per glass at Cafe Chloe (below). Baumard, one of my favorite Loire Valley producers, is famous for dry Savennieres and sweet wines from Coteaux de Layon and Quarts de Chaume AOCs. This was my first taste of one of Baumard's sparkling wine. It had a light floral nose and an elegant and fresh tasting palate of citrus and green apple. A bit mineral, and very tasty. I haven't seen this wine at my local haunts, and I have no idea what the price would be per bottle, but I'm guessing around $15, and it would be a good value at that price. 2002 Baumard Savennieres Clos du Papillon, about $25, no longer available. This is Baumard's most highly rated Savennieres. Probably opened too early. The wine had an interesting but jumbled and tight nose of flowers, barrel toast, citrus, and what seemed like white chocolate. Medium body, nice hints of vanilla, ginger, and minerals, with good acidity, but palate too is tight and young, a little backward. I have a bottle of this wine somewhere and I am excited to taste it...in about 10 years. We ate at two restaurants that we really liked. One we go to every time we're in the San Diego area, a Mexican place called El Callejon in Encinitas. This place has at least 100 tequilas lining the walls. Lots of fun to look at, and even better in their excellent margaritas. The food is also quite yummy. Favorite dishes include Cebollitas Cambray - grilled scallions with lemon and Maggi sauce (yes, Maggi sauce, that brown stuff that you might add to gravy, or something). The tacos are unusual in that they are stuffed with meat - enough to make 4 or 5 typical tacos. I am partial to the Cochinita Pibil, chunks of pork cooked with achiote and orange. There is indoor and outdoor seating, a good vibe, and unlimited chips made on premises by deep frying tortillas, with good tomatillo salsa. Cafe Chloe is a lovely place in downtown San Diego. Part wine bar, part brasserie, part chic bar hangout, this place is definitely on our go-to list from now on. The food was truly excellent. A mix of traditional and innovative, with fresh ingredients, uncluttered so as to present the simple deliciousness of each dish. Some one put together a great list featuring wines of all styles, mostly French, most available by the glass or the half glass - a wonderful way to create your own tasting with each course. And since a half glass turned out to be a generous pour, an excellent value too. Our favorite dishes were the superb "savory custard of the day," shrimp and red pepper on that evening. This was ethereal stuff, each spoonful immediately creamy and light, delicately whispering of savory shrimp and red pepper. Served with an excellent salad of frisee and other baby greens, and topped with crisped scallion skins. This was the finest dish I have had at any restaurant in a very long time. We also loved the trout almondine, a special that day. A traditional dish that was beautifully presented with herbed fine breadcrumbs atop a generous plump trout fillet. No cream in this dish, it instead relied on fresh fish, almonds, and herbs. I've been asking these questions at my reliable local wine shops and getting different answers. So I share with you these hopefully interesting questions and ask for your opinions. Please share! 1) Why is rose of Champagne always more expensive than regular Brut Champagne? 2) What are the "proper" glasses from which to drink Champagne? I assumed flutes, or maybe coupes, but in Theises's catalog I noticed wine makers drinking their Champagne from what looked like regular white wine glasses. Are flutes purely decorative? Are white glasses better for encouraging the aromas of Champagne? 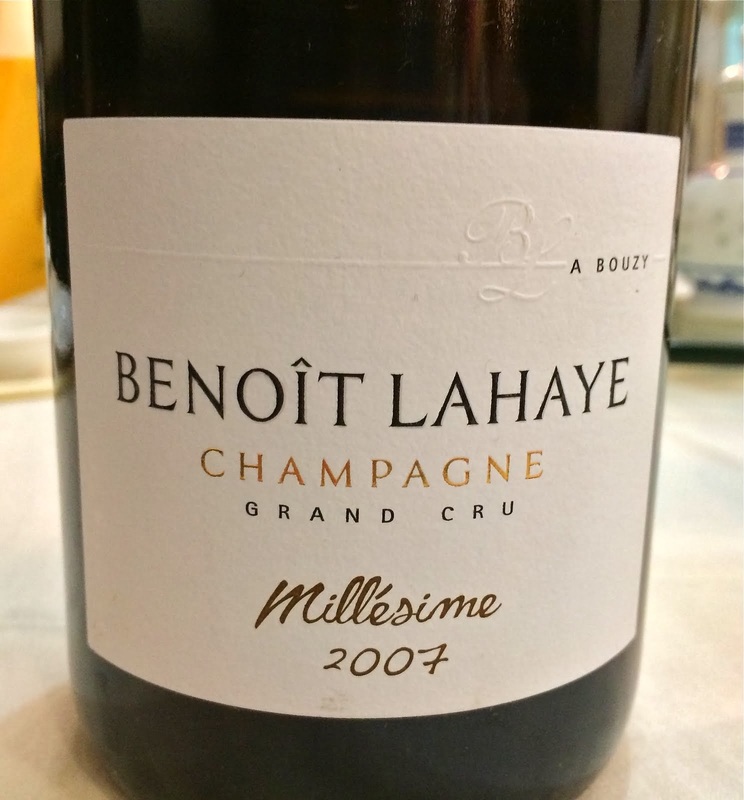 3) Champagne can withstand colder aging temperatures than still wine, from what I've read. Is the refrigerator (yeah, the regular one with my vegetables, milk, miso paste, etc) okay for short term (1 year-ish) cellaring? 4) Why won't you just give me a bottle of that '98 Billecart-Salmon to taste? I promise I will appreciate it, and share it with friends. I've been slowly but surely exploring Champagne in the past year or so, tasting as many as I can from both the big houses and individual growers. "Big house" refers to producers who purchase grapes from various growers and craft a Champagne that expresses a certain style that will be consistent from year to year. Examples of big house Champagne include Perrier-Jouet, Bollinger, Krug, and Duval-Leroy. "Grower Champagne" refers to wines that are crafted from grapes grown by the producer. Examples of grower Champagne include Lallement, Pierre Peters, Gaston Chiquiet, and Henri Billiot. The distinction between "big house" and "grower" Champagne is an economic one. If a grower can profit from making wine (assuming they want to make wine), they usually make wine. If the costs of facilities, equipment, labor, risk, etc. are high enough, a grower might instead elect to sell grapes. Some producers both sell grapes and make wine. In Champagne, there is room for market manipulation, apparently, and this is much under discussion lately. What happens, for example, if the financially deep "big houses" band together to squelch the supply of "grower" Champagne? How would they do that? By promising NOT to purchase grapes from growers who also make their own Champagne. Alice Feiring wrote about this recently and Eric Asimov mentioned it also in his recent blog post. Stylistically the difference between big house and grower Champagne might not be detectable in a blind tasting - I wonder whether or not tasters would be able to identify wines as big house or grower in a blind tasting. Note to self - make this tasting happen this holiday season. I prefer to buy grower Champagne because I like the idea of buying wine made by a family who also grows the grapes, and also the idea of supporting smaller (or medium sized) businesses. I happily drink big house Champs too, but only when some kind soul is pouring it for me. When it's my dollar, I go for the growers. Grower Champagne in my favorite wine shops tends to cost in the mid $30 to mid $40 range, a bit more for rose. Not cheap by any means, regardless of the value. So how to choose bottles to taste when a flop means over $30 out the window? I look for " A Terry Theise Selection" on the label. Theise has been a thorough and amorous student of Champagne (and other wine too - German Rieslings...) and his catalog (also recommended by Mssr. Asimov) is a great place to start. Henri Billiot Brut Réserve, N.V. Many times I’ve felt, and said, this is the best N.V. Brut in all Champagne. That I’ve tasted! But I’m going to hedge just a little on the current cuvee, until I see what it does on the cork. I tasted a wine disgorged 2/07, made up of 50% 2003 and 25% each of ‘02-‘01. It was racy, loaded, complex and potentially amazing, but it was also disjointed and querulous from disgorgement-shock. The cuvee is always about 80% Pinot Noir but no one ever guesses, the wine is so animate, kinetic and hyper. Henri Billiot Brut Rosé, N.V. I forget how good this is because it’s always gone before I have a crack at it. They were pouring at at Alinea and I had a glass, and for a moment I almost forgot where I was (almost! It’s hard to forget when you’re sitting in the greatest restaurant in America…) the wine was so absurdly delicious. Again I tasted an 02/07 disgorgement but the Rosé withstood it superbly. The wine is always a year younger than the NV Brut, based only on demand; this one’s 50% ‘04 and 25% each ‘03-‘02, and the still red is 10-year old Ambonnay Pinot Noir. This may well be the best bottling yet; pure, direct roses and strawberries; chalky, vinous and charming; virtually perfect. I don't know about you, but that really piqued my interest. So we recently tasted two Champagnes from Henri Billiot. We opened the Brut Réserve with a dessert of stewed rhubarb with fresh Vermont ricotta and a touch of wildflower honey - a terrific pairing. The astringent rhubarb with the rich and creamy ricotta went perfectly with the crystalline bubbly. Henri Billiot Brut Réserve, N.V., $36 (Chambers Street Wines). Nose of brioche and toast - lots of toast. Later on some berry and floral aromas. Honeysuckle, citrus, and a bit of yeast on the palate. All of this hangs on a strong frame of icy-stalactite acidity (yeah, that's a weird description, but work with me on this). Elegant and velvety mouth feel, but a lso structured and powerful. It is this contrast that makes the wine so fascinating to me. A definite re-buy. We opened the rose to celebrate making it back to Brooklyn from out west in one piece, with a healthy and some what well rested baby. We enjoyed this wine with our brunch of Tello's Farm eggs, Flying Pig's Farm smoked ham, and Pain D'Avignon rye bread. Sorry - I am not one of those people who forces you to care about where my food comes from, but I do really like all of these products, so indulge me this once. Another great pairing, as the very dry rose bubbly worked perfectly with the smoky ham. Henri Billiot Brut Rosé, N.V. $45 (Chambers Street Wines). Lovely pale rusty pink color. Reserved nose at first but then glows with strawberry, flowers, toast, and caramel. Fresh palate with strawberry and some chalk, but the thing is the texture and the structure - light and elegant but somehow full and strong at the same time. Solid and ethereal. A great acid backbone. Another definite re-buy, but at $45 this falls into the special occasion category (sadly, as I could happily drink it every day). Definitely not trying to steal Joe's thunder here, not that I could anyway. But after discovering this little lovely from Domaine des Cassagnoles for $10, I had to keep going, to taste more white wine from Southwest France. I like everything about these Southwestern whites so far. I like their vibrant citrus and exotic fruit flavors, their food friendliness, their light texture - perfect for summer, and I definitely like their price point at about $10. I also like the names of the grapes - they sound like French detectives. Have no fear, Detective Colombard is on the case. Or, careful buddy, better wipe away those prints or Gros Manseng will catch you. At the end of last year I was blind served a glass of Domaine de Pellehaut white and did a triple take. Man, I said to myself, I'd like more of this, figuring it'd cost about $20 a bottle. Well, it was more like $7 so I bought some, I told my family to buy some, etc. The 2005 is all gone I'm sure but the 2006 is starting to appear. 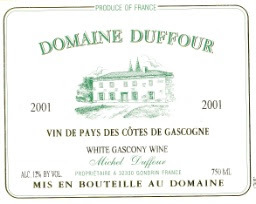 2006 Domaine Duffour Vins de Pays des Cotes de Gascone, $8 (Chambers Street Wines). Screwcap, which is fine by me, and a nice low 12% alcohol level. Strong cat pee smells upon pouring, but they relax a bit and blend with the grass and citrus aromas. The cat pee never entirely leaves though, and this is not something that I particularly care for. Yeah, I know that it's normal in many whites, expecially Sauvignon Blanc, but that doesn't mean I have to like it, pal. Pleasant light texure with clean citrus and rainwater flavors. This wine is certainly pleasant, but it does not measure up to the Domaine des Cassagnoles. The Duffour began to fade about a half hour after opening, and never really had the depth and complexity of the Cassagnoles, which by the way was twice as good with 24 hours of airtime. You have to spend a full 25% more for the Cassagnoles, which in this case is 2 United States Dollars, and I recommend that you spend it. 2006 Olga Raffault Chinon Rose, $15 (Chambers Street Wines). I'm not taking sides in the rose debate. Instead I will just say that this is my favorite rose this summer. A rose of Cabernet Franc, this wine is more pink than salmon colored, but its a muted and classy pink. Very floral in the nose, fruity but dry with snappy acidity, this wine is a pleasure. 2005 Francois Cazin Cour-Cheverny Vendanges Manuelles, $13.50 (Chambers Street Wines). Cour-Cheverny is a tiny appellation in the north-west part of the Loire Valley. It is the home of Romorantin, the highly acidic grape beloved by acid-freaks and wine geeks everywhere. I usually love this wine, but oddly, I have tried the '05 version a couple of times now and I am not inspired. I prefer the 04. Again, strange - '05 was supposed to have been perfect growing conditions. I have high hopes for Cazin's Cuvee Renaissance, the late harvest wine with lots more residual sugar. You know, the one that ages like a great Riesling, but costs about $18? 2005 Champalou Vouvray, $16 (Big Nose Full Body). In my pantheon of Vouvray producers, Foreau and Huet are both Zeus. There are lesser gods - gods yes, but not Foreau or Huet. Champalou is one of those producers. Champalou puts out small quanitites of highly prized moelleux (sweet wine), and also several cuvees of dry Vouvray. This is the entry level bottling. I very much enjoyed the crystalline and incredibly drinkable 2004 Vouvray, so how would the "vintage to end all vintages" 2005 be? Not as good, as it turned out. Too big for its britches. Lemon curd and meringue on the nose and palate, with lots of fat. Even on day two, and there is not enough acidity to balance things out. This is good wine, with fresh flavors, but it is in the end, not all that drinkable. Too much meringue. Was this just too ripe, or did the wine maker indulge too much, and not rein things in? 2005 Chateau de Hureau Saumur-Champigny, $14 (Chambers Street Wines). You know, between Roches Neuves, Filliatreau, and Hureau, Saumur-Champigny has become my go-to appellation for food friendly, delicious, but inexpensive Loire reds. This wine is just fantastic at this price. A nice nose of dark fruit, some flowers, and a bit of tobacco, and a juicy and lush palate that mingles dark berries with some earth and a bit of cocoa. This is not a very complicated wine, but it's SO good, guaranteed to make you smile. This is absolutely a $15 Beauty. 2004 Adelsheim Pinot Noir Goldschmidt Vineyard, $40 (Winery). A venerable Willamette Valley producer, Adelsheim has been putting out quality wine since the early '90s. I must say, though, that I have not been as impressed by their recent offerings as I was by wines from 2002 and earlier. I heard they replaced the wine maker, but I'm not sure. I have yet to really enjoy one of their 2004 Pinots, and that is really sad because I was on the mailing list for their entire (expensive) Pinot lineup. I first tasted this wine in the company of a few phenomenal Burgundies, and it was clearly the inferior wine. But with another 18 months of bottle age, what about now? No better. Here were my notes from our dinner that night: Nice blueberry and earth smells right out of the bottle, but they drift away rather quickly, leaving not much in its place. Good wine, but so uninteresting, and at $40, incredibly overpriced. What's interesting, is that this wine received 92 points from Tanzer. Would he have liked it less with dinner? Am I missing something? Who knows. Points are a bit silly anyway, no? 2004 Sineann Pinot Noir Resonance, $46 (Avalon Wines). Sineann makes several Pinots, a Zinfindel, Syrah, a Cabernet, and plenty of white wine too. The fruit is sourced from all over Oregon and Washington State, Peter Rosback the wine maker is a bit of a cult figure, and the wines get consistently high scores. I figured out a little while ago that although I recognize the quality, the style is not my favorite in Pinot Noir. I paid a load of money for this wine about two years ago when I didn't understand what I could could get for the same $. Can't hold onto the bottle forever, and a recent good review by Dr. Debs made me think that it's time to open mine. I don't know - everyone on CellarTracker who tasted this wine LOVED it - 95 points, 94 points, etc. Not this Brooklynguy. I thought it was huge and hot, with little Pinot character, and with nothing to think about. A mishmash of bigness, if you will. My favorite Pinots are elegant, with several, often conflicting aroma and flavor characteristics. This was dull and uninspiring, and honestly for my $45, I could buy almost two bottles of far superior Pinot today. Sorry for the rant, but it's really against myself and my proclivity for spending way too much on sub-par wine a few years ago (and probably today too but the jury is still out). My notes from that night: Fine fresh cherry smells and flavors, velvety texture. But simple and unidimensional, and a poor value at this price. Julienas, with Saint Amour is the northern most Beaujolais Cru. Along with Moulin-a-Vent, Morgon, and Fleurie, Julienas enjoys name recognition that the other Crus have yet to establish in the United States. And like wines from those other communes, Julienas produces some wines that can improve with cellaring - both the Oxford Companion to Wine and Hugh Johnson's Pocket Wine Book say a couple of years (2-3). I bet that the Michel Tete Julienas Cuvee Prestige could improve for longer than that, in certain vintages. I had the opportunity to taste two wines from Julienas recently. 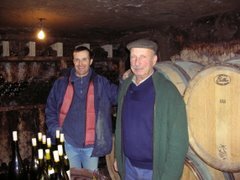 Opposites, in a way, as one wine is made by Georges Duboeuf, the huge negociant whose label graces about 10% of all Beaujolais wine each year, and the other by Michel Tete, the grower producer who still bottles his own wine. These were tasted blind - I had no idea which was which, and there were several other Beaujolais at the table too to confuse matters. I very much liked both of these wines, and when it was revealed that they were Julienas, I decided to include them in this edition of the Beaujolais Challenge. What about 2003 in Beaujolais? This was an incredibly hot year, and acid levels were down in the fruit, as in most wine regions. I know that good Cru Beaujolais can improve with cellaring, but this was a somewhat baked and low acid vintage - how would a wine from 2003 perform now in the summer of 2007? Tete's Cuvee Prestige is reputed to be "aromatically backward in its youth." I have tasted this wine in each of the past few years and loved it. Made from old vines, it is deep and complex, yet beautifully expresses the floral and berry lightness of Beaujolais. I have never tasted an aged version of this wine. How would this entry from 2005 perform in its youth? 2003 Georges Duboeuf Julienas Prestige, (price unknown). Duboeuf's Prestige wines are limited in quantity and are supposed to best represent their terroir. So within Julienas, for example, there are three wines, Julienas Fleur (the Flower label), Chateau des Capitans (Capitans is a prominent grower in Fleurie), and this wine, Prestige, Duboeuf's top wine from Julienas. Dark, attractive purple with a fresh and lucious nose of ripe fruit. This follows through on the palate - lots of juicy fresh fruit with a snappy underlying acidity. This wine made everyone's shortlist, without question. Without any complexity, yes, but highly drinkable and immensely enjoyable. 2005 Michel Tete Julienas Cuvee Prestige, $24 (Chambers Street Wines). Incredible to me that this wine did not just outclass everything else we bagged - this is amazing juice. But it didn't. It was lovely, yes, but clearly there is something to be gained by cellaring this wine for a few years. That said, I enjoyed this exact wine twice over the past 6 months and each time it was beautiful. There really is something interesting about bagging wines and tasting them blind - you never know how things are going to show. The way I like to do it is to not know the wine lineup at all. Someone can slip a top wine like this into the pack and we taste without prejudice. Same goes for Two Buck Chuck. Anyway, this wine had a strong mineral streak early on, but the red cherries overcame their initial shyness and were only a little shy in the end. I like the edges of potting soil and cherry liquor that I get from this wine. But the fruit had not yet fully revealed itself. I would be curious to taste this wine again in a few years. Happy 3rd anniversary Wine Blogging Wednesday! And congrats Lenn - you started something truly extraordinary here. People from all over the country and all over the world look forward each month to participating in and reading about Wine Blogging Wednesday. And why not participate? You don't even have to be a blogger. All recent hosts have invited non-bloggers to join in, sending reviews and experiences with whatever the theme wine is that month. An online community of bloggers sharing experiences with certain wines each month, and inviting all interested parties to join, to be bloggers if only for that once a month. We all taste something, we all learn something, we all read each others' work. A simple idea, but very elegant and effective. Lots of people who might not otherwise be interested take the wine plunge because of WBW. I started a blog myself because of a Wine Blogging Wednesday post I read on Fork and Bottle, actually. So this month's theme is Naked Chardonnay, or un-oaked Chardonnay. Why specify un-oaked? Because Lenn is some sort of freak? No, friends, not the case at all (with regard to wine, anyway). From the late '80s through the late '90s (all dates are approximate, and cannot be confirmed) Chardonnay was generic swill that the masses got when ordering white wine. No reason to ask who made the wine or where it was from. "Just give me a Chardonnay. And you know what, make it a spritzer." How did it get that way? A load of producers in California were fattening and candying it up, allowing it to see plenty of new oak and encouraging malolactic fermentation to convert the sharper malic acids into smoother lactic acids. The end result often was described as rich and buttery. People went nuts for it. I guess people here weren't ready to drink Chardonnay in its unadulterated form, with its steely minerals and strong acidity. That wasn't the thing people were looking for when they asked for a Chardonnay. Gone was the vibrant acidity and the slender frame, the mineral character. It was all about buttered popcorn, caramel, toffee, and other aromas and flavors that have little to do with the grape juice and more to do with the application of oak, malolactic fermentation, and who knows what other manipulations. There are still folks who swear by huge buttery Chards, but it's not what most of us are drinking. And the folks ordering a glass after work at their power-drink sessions or at dinner with friends, well last I checked it was a generic Pinot Grigio they were asking for, but I'm not up on the latest trends. Slowly but surely, lots of people begin to remember and seek out Chardonnay - true Chardonnay, wines that express that grape's character. Steel fermented is a great way to experience Chardonnay - nothing in the way of the juice. That said, there are plenty of examples of great and true Chardonnay that do, in fact, see new oak. Judicious application of oak is a sign of great skill in a wine maker. Heck, they've been making incredible Chardonnay in Puligny, Chassagne, and Meursault for over 100 years and they're definitely using new oak. So why naked or un-oaked Chardonnay? I guess it's a way of rejecting the buttered popcorn style of the Gordon Gecko era. A way of saying "don't forget about Chardonnay because it is wonderful and it's sitting right under your nose at every price point and you should try it again." For some reason I decided that we would taste them blind. It's the 3rd anniversary of WBW - why not celebrate? Brooklynlady and I enjoyed a delightful dinner on the deck last weekend - grilled Spanish mackerel sprinkled with sea salt, fresh farmer's market bi-color corn on the cob, and a green salad. We bagged the two wines and got to it. 2005 Litaud Macon-Vergisson Domaine des Vieille Pierres, $14 (Chambers Street Wines). Blind I thought this was the Chablis, as it was leaner and more mineral than the other wine. It had distinct citrus and fennel aromas and flavors early on. Interesting, but we both agreed that the other wine was better at that point. It was obvious to me, though, that this wind needed time to unravel. A taste near the end of the meal didn't show much change. I pump sealed the wine and left it in the fridge over night. Then my pal Nick came over for lunch the next day and WOW - the wine had really blossomed. Rounder with a fuller texture and mouth feel, and well balanced with fleshy stone fruit - peaches maybe - hanging on a gently mineral and acid frame. Delicious and crisp, excellent with our lunch of pasta with fresh tomatoes and pesto. 2005 Domaine Boudin Chablis, $19 (Chambers Street Wines). This wine was fuller bodied to begin with, with aromas of citrus and stone fruit. The palate was rich with sweet fruit and there was a slight pleasant smokiness on the finish. I read in the recent Burghound newsletter that Chablis in 2005 in many cases is more about Chardonnay than about the terroir that is Chablis. I take that to mean less about seashell minerality and lean citrus, and more about ripe fleshy fruit. Well, it certainly fooled me, as I was certain that this was not the Chablis. We preferred this wine with our rich and oily Spanish Mackerel and sweet corn, and we drank more of it than of the Macon. I should have pump sealed the last third of the bottle, but I never got to it and instead just corked it and put it in the fridge. The next day at lunch with Nick (a guy who couldn't care any less about wine), I poured him tastes of both so he could choose what he wanted with his pasta and he unhesitatingly picked the Macon. I was surprised - the Chablis seemed more accessible. But I hadn't sealed it and it didn't hold up well. The fruit had faded and the texture was kind of thin. But the Macon had come into its own, and was perfect with lunch. Thank you again for WBW Lenn and also to everyone else who participates by posting and reading. Looking forward to many more. I don't usually like to make pronouncements because it's just too easy to be wrong or to change my mind. But in this case, I'm going for it. Pronouncement: I, Brooklynguy, have discovered the finest value-priced Pinot Noir of the season. Actually, it's a blend of Pinot and Gamay, so maybe instead I should say that it's the finest under $15 red wine of the season. But since we've all been looking for that elusive beautiful but inexpensive bottle of Pinot, and simply not finding it (unless $28 is value-priced, and it can be with Pinot), this counts as value-priced Pinot in my book. Not sure of the exact blend, but I'm betting it's half Pinot, approximately. So here is the wine, before you get yourself into an uproar. It's the 2006 Clos du Tue-Boeuf Cheverny. This is a Loire Valley wine, naturally. It costs $13.50 at Chambers Street Wines, and it's honestly just fantastic. I'll tell you more about it in a minute. First, here is what I can tell you about Cheverny. This is one of those small appellations, obscure I guess (but this blog is not esoteric, dammit), created only 14 years ago in 1993. This is just north-east of the Touraine appellation - you can see the area in gray below. The rules for Cheverny wines are both strict and highly subjective at the same time. Wines labeled Cheverny must be blended. That's right, no matter how wonderful your Pinot or Cabernet Sauvignon might be in a given year, if you bottle wine made solely from that varietal, your wine becomes Vins de Pays, not Cheverny. But blend them together and you have Cheverny. For red wine Pinot Noir, Gamay, Cabernet Sauvignon, Cabernet Franc, Malbec, and the obscure Pineau d'Aunis are allowed. White wines labeled Cheverny may contain Sauvignon Blanc, Chardonnay, and Chenin Blanc, but every white Cheverny I have encountered is primarily a Sauvignon Blanc with a bit of Chard blended in. Is there a rule about how much of a particular grape is allowed? What about the number of grapes in the blend? Can you use 99% Pinot Noir and a touch of Gamay? Who knows. But if your wine does not pass the muster of the INAO's tasting commission, no Cheverny on the label. Vin de Pays or Vin de Table. Why would a wine not make it through the tasting commission? They might not think it representative of the appellation's wines, for one. Yes - that's the subjective part. Cheverny, like many a Loire Valley appellation, is a jackpot of delicious, naturally made, low alcohol, and inexpensive wines. Wines that show off the true character of the grapes they are made from. This red from the 2006 vintage is a great example - it's absurdly delicious and completely food friendly, and if you plop a fifty on the counter you're gonna get three bottles of the stuff, and some change back. And Clos du Tue-Boeuf? It's made by the Puzelat brothers, Thierry and Jean-Marie. 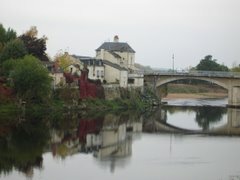 The Puzelats have been making wine in this part of the Loire Valley for about 500 years. Thierry is the cool-cat younger brother, a bit of a cult hero in Paris, and Jean-Marie is the grounded older brother. Thierry, by the way, sources grapes to make wine under his own label, including one of my favorite Loire sparkling wines every year, the Puzelat Petillant. 2006 Clos du Tue-Boeuf Cheverny, $13.50 (Chambers Street Wines). I think Tue-Boeuf means "cow-killer," but I'm not sure. The label sports a multi-colored cow with what could be angel's wings, so go figure. This blend of Pinot Noir and Gamay has a clean nose of dark red berries and once open for about 10 minutes, vivid floral aromas - dark violet. Pure, juicy, and sweet, this is a bowl of black cherries on the palate, with pleasant earthiness and lip-smacking acidity. As the foam cork indicates, this is not a wine for aging, and it is not trying to wine the complexity award. It is pure pleasure, delicious on its own or with food, drink-me-now-and-smile share me with your neighbors wine. This is a top-top highest recommendation wine for me - check it out if your shop carries it. Fleurie is one of the big shots of Beaujolais. Not because of its size, and it is one of the larger Beaujolais Crus, but because of its reputation for highly perfumed and delicious wines. Not surprisingly, wine from Fleurie tend to be a bit more expensive than wines from some of the other lesser known Crus. But there are wonderful values in Fleurie , particularly when you consider that you're talking about $22 or $23 for the most expensive bottle, and more like $17-20 for a typical bottle. We in the US have more choice as consumers when shopping for Fleurie, more than when we look for Regnie, for example. Some Fleurie producers whose bottles you are likely to see if you go to your good wine shop: Roilette (the one with the cool label featuring the horse's head), Chignard, Despres, Terres Dorees, and Vissoux, whose wine I tasted recently. Some people like to cellar wines from Fleurie, along with Moulin-a-Vent, Morgon, and Julienas. I will admit that I have never aged a Beaujolais wine. I'm sure that there are wines that improve with bottle age, and I I hope to taste a couple of examples soon. It's just that Beaujolais is about easy going times and picnics for me, and I don't associate that with the cellar. I like to drink Beaujolais the way we did the other night - chilled with some tasty food on our deck, enjoying the breeze, not thinking too hard. 2005 Domaine du Vissoux Pierre-Marie Chermette Fleurie Poncie, $19 (Chambers Street Wines). I really LOVE the 2005 Beaujolais from Vissoux, and I remember Senor Asimov writing that he really liked their Fleurie, so I was excited to taste this wine. We had a simple dinner of chicken thighs and a salad with red beets and cucumbers - perfect for Beaujolais. This wine was quite dark and dense in color, and aromas of raspberry and flowers immediately soared from the glass. There was an undertone of soil and a bit of dried banana on the nose too. On the palate, though, the wine was a bit flabby and out of focus. Pleasant and tasty - yes. But without energy. I remember drinking the Descombes Regnie a little while ago, and one of the things I now understand (I drink, I learn...) that I loved about that wine was its energy. It felt like it was moving on the tongue. 30 minutes of air time did not bring an energy boost for the Vissoux. Of course, Asimov decanted his and gave it 2 or 3 hours before drinking. After that it held its own with a Fourrier Morey St Denis! I should have decanted, I guess. It was certainly good wine and we enjoyed it with our dinner. But for $19 I'll take the Regnie every time, or if I'm having company for dinner, I'll throw in another $7 and buy 2 bottles of the Vissoux Beaujolais, instead of this more expensive Cru. Wine Blogger's Gameshow, Starring Doktor Weingolb! Everybody's favorite Doktor from Montreal was in New York City recently and he very kindly invited me to lunch. We went to Blau Gans, the Austrian place in TriBeCa that I've been meaning to try. Very tasty. I particularly enjoyed the Arctic Char garnished with pineapple (! ), and the desserts were excellent. What a treat it was to have lunch with Marcus! Such a lovely guy, and such an odd shift of medium, from internet personality to real life. Last time I met a couple of bloggers in person I treated you to a little quiz, asking you to pick what is true about them from a list. The photo on Marcus' profile is actually a picture of his brother Martin, a Canadian soap opera (aspiring) actor. "Weingolb" as a name originates from a combination of "Wein," German for wine, and "golb," blog spelled backwards. Marcus arrived at the restaurant before I did, and when he stood up to shake my hand I noticed that he was barefoot. e said "we do this all the time in casual places in Montreal." I told him that the restaurant would not appreciate it if they saw this, and Marcus put his sandals back on. Marcus saw the Sonic Youth concert in Williamsburg while in New York. Marcus visited the Morgan Library while in New York. Marcus took a scenic tour of Brooklyn by public bus while in New York. Marcus spit every few sips of the red wine he was drinking back into his glass. "Makes it last longer," he explained. Marcus has a Burmese python, a unusual in that he rescued it from being euthanized after it killed a large dog. Its previous owners had abandoned it near the woods near Mont Royale. Marcus has a 9 bottle wine fridge at home - 9 bottles! Marcus has a 500 bottle wine fridge at home - 500 bottles! Okay, feel free to leave your responses as comments. How much do you think you know about Doktor Weingolb? Common wisdom holds that good Pinot Noir should be consumed either while young, or left alone to mature in the cellar for at least five years. About a year or so after release, Pinot Noir shuts down in the bottle. What happens to the wine during those adolescent years? Chemically speaking, I don't know, but I would be interested to learn. With regard to aroma and flavor, the fruit goes away and the wine is awkward. Makes for unpleasant drinking during these years. Some people call this the dumb phase. If you think about it, the life cycle of Pinot is like the life cycle of a typical person. Delicious, plump, and sweet as children, easy to love. Adolescence brings moodiness, an awkward appearance, and an affinity for hanging out with friends in dark and humid places. But if well cared for, the awkward adolescent blossoms into a mature person with many aspects to their personality. Enough time, however, and this mature person begins to decline. 2005 Paul Pernot Beaune Clos du Dessus des Marconnets is a beautiful wine and a great value (between $23-30, depending on where you shop) in a wonderful but expensive Burgundy vintage. I tasted and then bought more of this wine back in January. I enjoyed another bottle with BrooklynLady in February after our daughter was born. I haven't opened a bottle since then. My good buddy Adam called the other night to tell me that his dinner guests were about to arrive, he'd opened and decanted a bottle of the Pernot, and it was terrible. Not moldy, no sweat socks - in other words, not corked. Just bad. No fruit, astringent, alcoholic. "What's up with that," he asked "This wine was great a few months ago." I hung a stethoscope around my neck and asked Adam if he checked the level of the cork before opening the bottle. He assured me that it was below the level of the glass. Okay - not cooked by heat. The symptoms didn't sound like heat exhaustion anyway, but I have to administer tests in order to rule out certain things, don't I? So I told him that it's possible that the wine is now in a dumb phase, and that its progression in the decanter may mirror its life cycle - that it might become tasty again in a few hours or longer. Or not. So what happened? forest. After 5 minutes, it was undrinkable. It tasted like pinetar or lacquer. Then, after 30 minutes, still pinetar. Smelled like lacquer or rubbing alcohol. smell mixed with the pinetar. (and Burghound agrees, by the way). So it sounds like dumb phase, alright. Adam went on to say things like "Brooklynguy, you really are a special person, one in a million, sharp as a tack," and other things like that, but I'll leave that stuff out and stick to the wine related material. So - do you agree with the dumb phase diagnosis? Have you experienced this with Pinot? Please share your experiences and opinions, if you will.